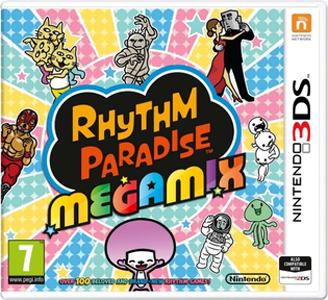 Rhythm Heaven Megamix, known in Europe as Rhythm Paradise Megamix, and in Japan as Rhythm Tengoku: The Best Plus, is a rhythm game developed and published by Nintendo for the Nintendo 3DS. It is the fourth game in Nintendo's Rhythm Heaven series and compiles stages from the series' previous entries; Rhythm Tengoku, Rhythm Heaven, and Rhythm Heaven Fever, as well as adding new ones. Game doesn’t work in Nightly builds, it’s playable only on Canary Citra. Game can be completed, but almost all levels run at 150% of the speed, music is also desynchronized and high pitched which makes games like Fan Club and Exhibition Match very hard to complete. Exceptions are Coin Toss, Sick Beats, Charging Chicken, Clap Trap, Quiz Show and Big Rock Finish which run at the correct speed, however, music keeps desynchronized. Game stutters when showing an image for the first time, more noticeable in Tongue Lashing and Working Dough. Slowdowns worsens desynchronization. LLE Audio corrects the pitch but the music keeps desynchronized and heavily slows down emulation.